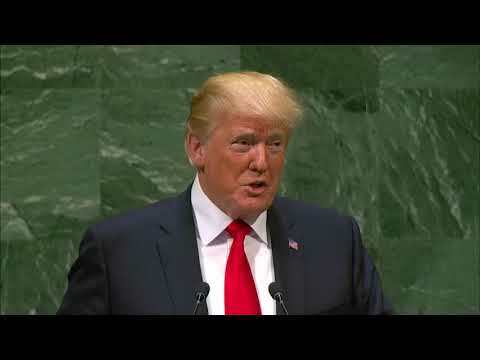 UNITED NATIONS (AP) — Taking center stage at the United Nations, President Donald Trump on Wednesday accused China of trying to interfere in the upcoming U.S. congressional elections because it opposes his tough trade policies. The White House provided scant evidence of anything akin to the level of Russia’s meddling in the 2016 presidential election. “They do not want me or us to win because I am the first president ever to challenge China on trade,” Trump said as he chaired the U.N. Security Council for the first time. He made his accusation against the backdrop of the special counsel’s investigation into Russian interference in the last election to help him and amid concerns that this November’s elections also could be vulnerable. Asked later what evidence he had, Trump said there was “plenty” but didn’t immediately provide details, suggesting that some of the material was classified. Instead, he zeroed in on China’s propaganda efforts to flood the heartland with ads and statements against Trump’s billions of dollars in punishing tariffs. The president also used his moment chairing the Security Council meeting on nuclear proliferation to issue a strong warning to Iran, which he deemed the “world’s leading sponsor of terror” fueling “conflict around the region and far beyond.” And he held a free-wheeling hour-plus news conference during which, clearly enjoying himself, he jousted with reporters over the fate of his embattled Supreme Court nominee, his endangered deputy attorney general, the media and even Elton John’s strategy of ending concerts with a hit song. Trump praised his personal relationship with China’s Xi Jinping and said he would call him on Thursday. He sidestepped a question in the news conference as to how he compared China’s meddling efforts with what Russia did. U.S. intelligence officials have said they are not now seeing the intensity of Russian intervention registered in 2016 and are also concerned about activity by China, Iran and North Korea. Trump’s statement caught lawmakers and some national security officials off guard as Beijing has not been singled out as the most worrisome foe. China has been accused of interfering in an election before, although not in the United States. Cybersecurity firm Fire Eye released a report in July describing “active compromises of multiple Cambodia entities related to the country’s electoral system,” including the National Election Commission, before the country’s July 29 general elections. The hackers’ methods matched a Chinese-linked hacking group tied to multiple cyber operations that have breached U.S. defense contractors, universities and engineering and maritime technology development firms.